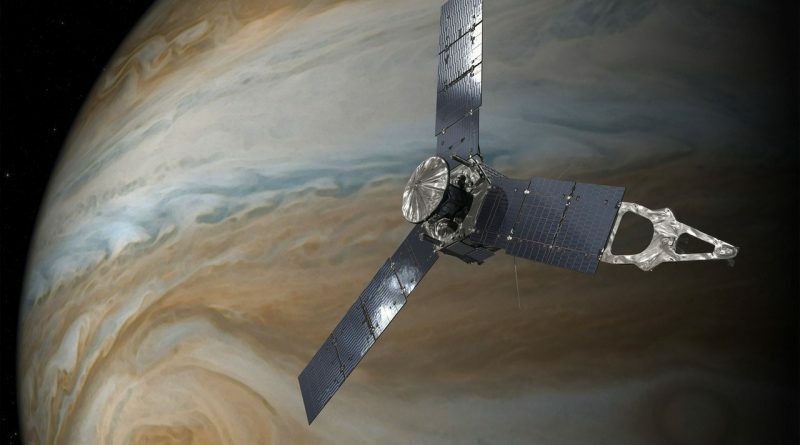 All fingers were crossed and all eyes were on the screens at NASA’s Jet Propulsion Laboratory where the signals from the faraway Juno probe showed the spacecraft slowing down to be captured in orbit around Gas Giant Jupiter. Arriving on Jupiter’s doorstep, Juno was pulled in by the planet’s intense gravitational field, accelerating to a top speed of 208,500 Kilometers per hour. To achieve orbit, Juno descended through the planet’s extreme radiation belts and had to dodge possibly lethal dust impacts before lighting its main engine for 35 minutes to be captured in a highly elliptical orbit around the gaseous world. Out in the dark reaches of the outer solar system, Juno was 868 million Kilometers from Earth when its main engine fired up at 2:30 UTC on Tuesday. 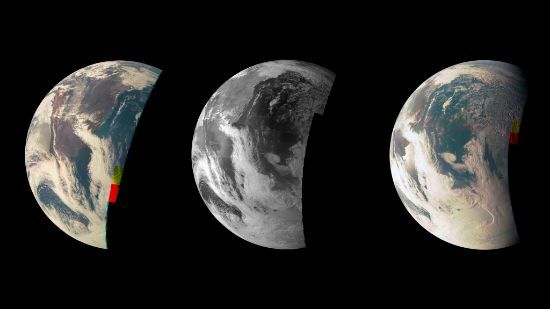 Traveling at the speed of light, signals from Juno reached Earth some 48 and a quarter minutes later, being received by large dishes at Deep Space Network Stations in California and Australia. Big cheers emerged when it became clear that Juno had executed a perfect burn, slowing down as expected to become the second spacecraft after NASA Galileo Probe to enter orbit around Jupiter. Though, the nail-biting was not yet over as Juno still had to point its three massive solar arrays back toward the sun to avoid dying of power starvation. 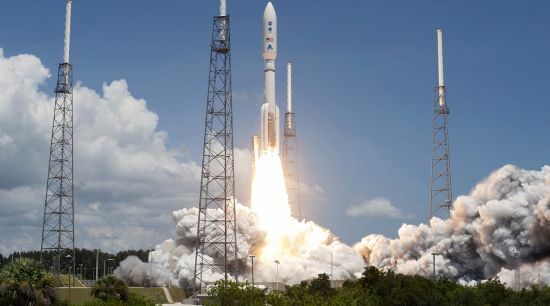 It was a tense day for Juno’s Mission Team as 12 years of work and around $1.1 billion hinged on Juno hitting the mark during its orbital insertion – considered one of the riskiest mission phases right up there with Juno’s ride atop an Atlas V rocket in August 2011. Given the lengthy communications delay with more than one and a half hours of signal round trip, the team could only sit by nervously and watch over data coming back from Jupiter. 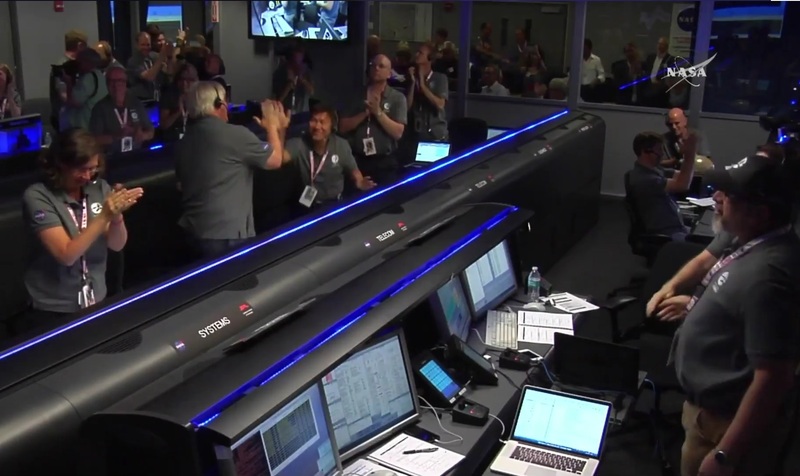 Teams at NASA’s Jet Propulsion Laboratory and spacecraft-builder Lockheed Martin were closely watching over the Juno spacecraft ever since it was switched to autopilot on Thursday, executing a pre-programmed sequence of events. Approaching Jupiter, Juno had had deactivated its nine science instruments on Wednesday – a measure taken to avoid an upset on one of the instruments causing the spacecraft heading into safe mode during or close to the critical engine burn. With all its resources focused on JOI, Juno entered its final preparatory steps at 1:13 UTC on Tuesday (Earth Receive Time, ERT). 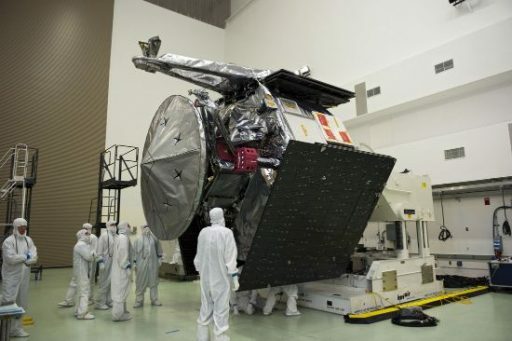 Data showed the spacecraft switching to its medium gain antenna and swinging to a 15-degree off-sun orientation. Insight into the mission’s progress was provided by tones – ten-second long signals at certain sub-carrier frequencies, each corresponding to a specific mission event or spacecraft status as a basic form of communications when Juno’s antennas are facing away from Earth. Tracking tones from Juno, the team saw the spacecraft initiate its maneuver to the proper orientation to hit the brakes with its deorbit burn, facing its Leros 1b engine to the direction of travel. 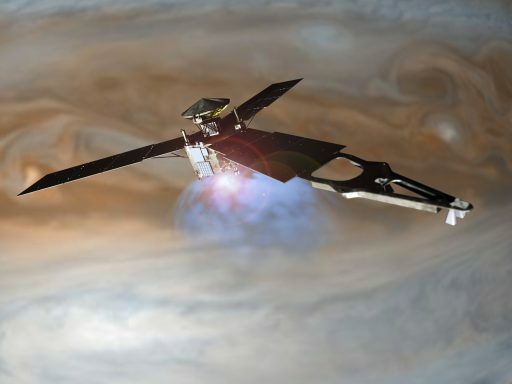 Juno dampened residual body rates, refined its attitude based on data from its Star Trackers and Inertial Measurement Unit and fired its Reaction Control System engines to spin up to five RPM for stabilization. At 2:42 UTC, Juno zipped 77,700 Kilometers above Jupiter’s north pole and the mission entered one of its riskiest phases with the spacecraft diving into Jupiter’s intense radiation belts where the radiation environment is a million times more extreme than in Earth Orbit – lethal to a human in a period of minutes and a big trouble-causer for electronics controlling the Juno spacecraft. 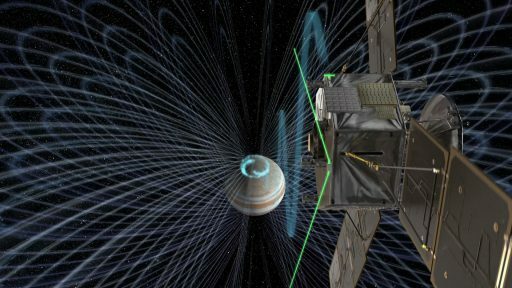 The Mission Team was well aware of the potential danger of radiation to Juno, but had a lot of confidence in the spacecraft’s radiation vault, shielding the computers and controllers behind one centimeter thick titanium. 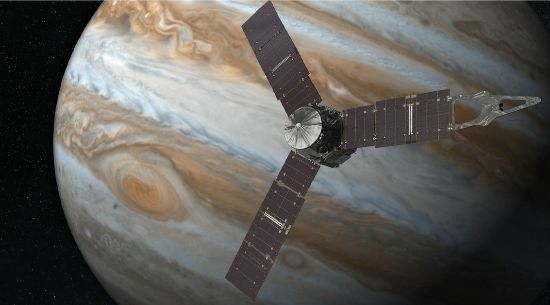 Aside from the 200 Kilogram radiation vault, Juno was equipped with a responsive flight software, ready to trigger a reboot of the flight computer and re-start the main engine in case of a radiation-related upset during the sequence. 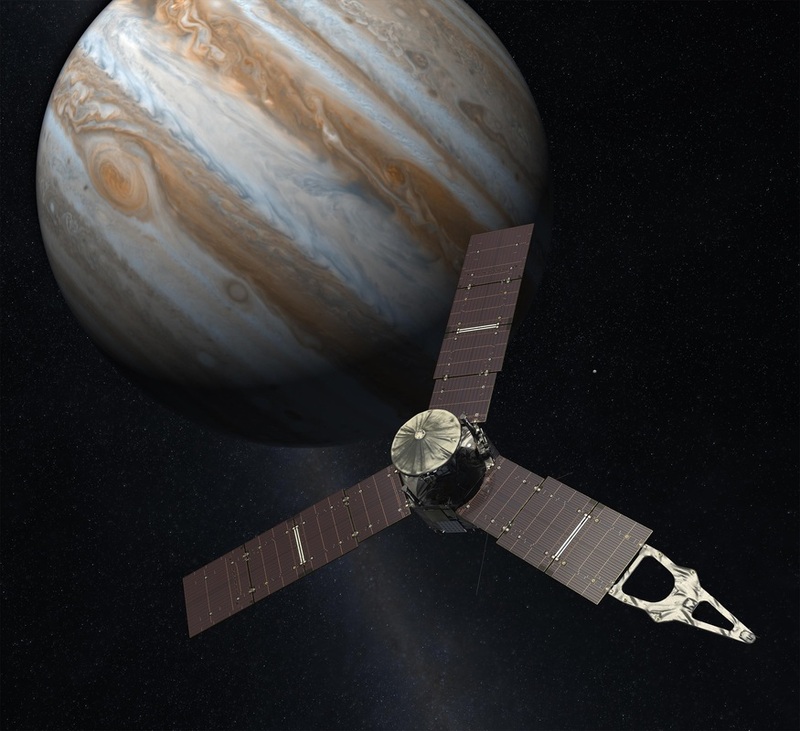 Juno’s main engine came to life at the expected time of 3:18:25 UTC (ERT) and the Doppler Tracking display showed a clear Doppler Shift Signature – Juno had started slowing down. Continuing its descent on a north-to-south pass over Jupiter, Juno approached the second big unknown of the night – possibly deadly dust particles originating from the planet’s ring system. Even a small grain of ice or dust 10 microns in diameter could have damaged Juno’s engine nozzle, and because the ring system’s extent is poorly understood, the mission team could not put a number on the risk posed by debris strikes. The team expected the highest risk of a debris strike around the time of Juno’s closest approach at 3:35 UTC when the spacecraft passed just 4,700 Kilometers over Jupiter’s cloud tops – ten times closer than any previous mission came to the gas giant. Firing the trusted Leros 1b for the third time since its 2011 launch, Juno was aiming to slow down 541.7 meters per second, in the process burning about 785 Kilograms of hypergolic propellants that self ignite when coming into contact inside the main engine chamber. 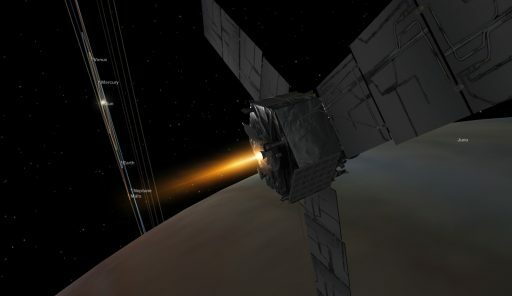 After a burn duration of 20 minutes, the Mission Team breathed a slight sigh of relief as Juno had reached a point where it was safely captured into Jovian orbit, though the full 35-minute burn was needed to be able to reach the proper science orbit chosen for this mission. 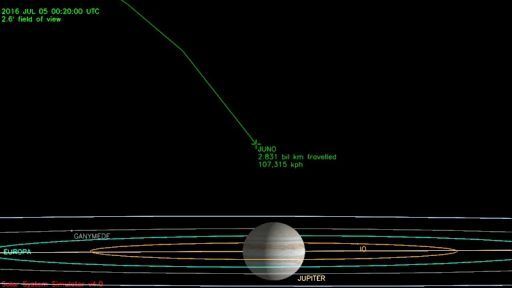 Juno was aiming for a Capture Orbit with a low point (perijove) around 4,150 Kilometers and a high point (apojove) taking the spacecraft as far away as 8 million Kilometers. The inclination was set by Juno’s approach path, a novel polar orbit inclined 89.8°. The Doppler Shift display continued to show Juno slowing down and engine cutoff was confirmed through tracking and tones at 3:53 UTC after a seemingly flawless orbit insertion burn of 35 minutes and 2 seconds, just one second off the prediction. But the successful conclusion of Juno’s engine burn was not the end of the night’s critical events as the spacecraft still had to spin down and point its 18,698 solar cells back at the sun to re-charge the vehicle’s batteries after relying on them for over 100 minutes. For Juno’s Principal Investigator Scott Bolton, the moment to celebrate came when Juno confirmed it was charging its batteries. Arriving at its destination after a journey of 2.8 billion Kilometers, Juno now sets out on 37 orbits around the gas giant, a 20-month exploration campaign lasting through February 2018. As part of its mission, Juno will sound the Jovian atmosphere to peer deep below the planet’s dense cloud layers to regions where pressures reach the extreme and no telescope can see. Using six different microwave channels, Juno will examine the structure, movement and chemical composition of Jupiter’s atmosphere to over 500 Kilometers below the cloud tops, possibly revealing the mechanisms behind Jupiter’s colorful appearance as well as large-scale energy transport obscured by clouds. JunoCam – classed as an educational payload – will deliver the highest resolution images of Jupiter ever obtained, owed to the low perijove altitude of the Juno spacecraft starting out at 4,150 Kilometers for its first low pass and slowly rising over the course of the mission to 8,000 Kilometers. Juno will also put to use its Star Trackers, primarily used for navigation but also available as basic imaging payloads, to support the search for new Jovian moons. The mission team expects a number of new moons to be discovered over the course of Juno’s mission. 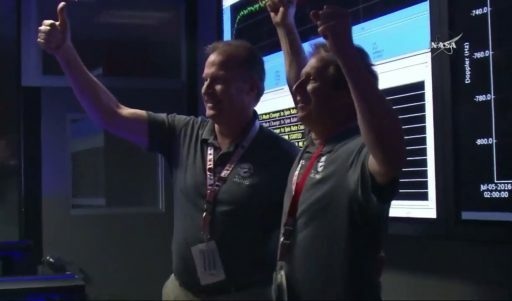 After some due celebration in the early hours on Tuesday, Juno’s mission team will head into Capture Orbit Operations, confirming the health of all spacecraft systems, playing back telemetry from the JOI burn, and re-activating the science instruments around 50 hours after orbital insertion. 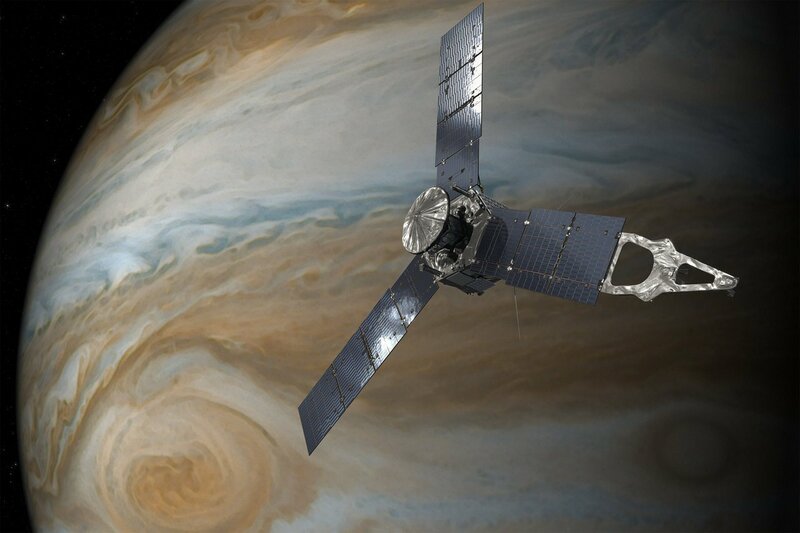 Now in a 53.5-Day Capture Orbit, Juno is looking forward to its next brush over Jupiter’s cloud tops at 12:51 UTC on August 27, providing the science team an opportunity to rehearse a typical instrument run around the perijove passage to set up for regular science operations. A major orbit adjustment is planned for October 19 to bring down Juno’s orbital period to 14 days for its 33 science orbits, enabling science operations to pick up in November.